House, 3 Bedrooms + Convertible bed(s), 2 Baths, (Sleeps 6 -8) with children. Winter: We are between three great ski resorts: Camel back, Big Boulder and Jack Frost only minutes away. With the new addition of the sun room, you can enjoy the view rain, snow or shine and see the babbling brook to relax in the cozy chairs and leave your troubles behind. Summer: Weekly rentals. Just 200 feet to beach - bring your beach chairs and suntan lotion for a relaxing time. Many water parks around us. Kalahari indoor water park is 5 miles away. 10 miles from Camel beach Mountain Water park Mountain Adventures. Great fun for the entire family. New bathrooms; bedroom furniture and kitchen recently redone. The stream in the backyard is a great experience for youngsters. We own the property next to ours and include a fishing dock, plus to the right is a community wet land. Just converted a bedroom to bunk beds to be used by children under 100lbs see photo - so bring the kids. Also, new queen size rustic furniture in master bedroom, new dresser in middle bedroom and refinished both bathrooms(2017). Come relax in our heated Sun Porch, see some animals and experience cooking in our new kitchen. Prefer you call me if interested. A lease agreement needs to be signed and returned. Please allow 2 weeks to process paperwork. Easy commute from DE, NY and NJ. There is a steep driveway so 4 wheel vehicles are recommended in the winter months. And only can accommodate 2 cars. Who cares what the weather is outside? During the Fall of 2009, we added a 2-story addition to the backyard of our house. The lower level (three season room) has a cozy sitting area. The upper level sun room includes a dining area and conversation corner that will permit year around viewing of lake, stream and wildlife. Our house is certified by the National Wildlife Federation so many animals pass bye. Located between two lakes with a stream and a wonderful extremely private setting. Lake at top of driveway feeds into our stream in the back yard and then into the cove which feeds into the largest lake. Thus, we call our home "Tween the Lakes. Depending on the rain fall, the cove water level will be affected. Only a few steps to one lake containing a beach,& playground. Other beach is about 2 miles away. Swing/bench in back yard near stream overlooking the largest lake in Emerald Lakes. This 3 bedroom, 2 bath offers a furnished family room w/ping pong table, air hockey, and dart board. Cathedral ceilings, wood burning fireplace, (need to provide your own fire wood) and a modern fully equipped kitchen. Stove, washer and dryer all new. Decks from master bedroom and from sun porch. Air conditioning in master bedroom in summer months. Ceiling fans in other bedrooms. 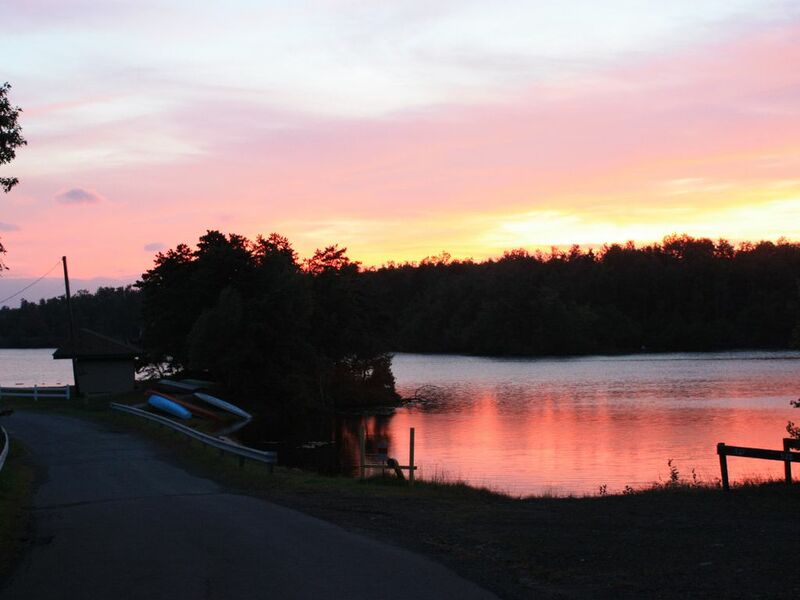 Location is a short drive to most Pocono activities, including Crossing shopping outlets, Pocono Raceway (NASCAR Races), Kalahari, Camel-beach water park, Camel-back, Big Boulder and Jack Frost, Mt. Pocono Golf Course, Mount Airy Casino Lodge, golfing, and other ski and golf facilities. Please check calendar below for availability! Must be 25 years or older and only renting to US citizens. Thank you for viewing our home. We give discounts to repeat renters. We pride ourselves in having a beautiful well kept home and hope you take extremely good care of it. We have many repeat renters who take good care of our home. Community is a residential one and has many amenities to offer. Easy to get to from NY, NJ and DE. There is a security agency and community watch program. We enjoy to see wildlife and with having a stream in the backyard, animals cross our property so we see a wide variety. Now with the newly furnished sun porch you can watch the animals year round. toilet, combination tub/shower, Located on main floor. toilet, shower, Shared bathroom between master bedroom & hallway. Stream located in back of house going into the largest lake in the community. Can view the largest lake in development from back yard. Back of house faces lake. Depending on the amount of rain fall will determine the amount of water in the lake during the summer months. The backyard has a stream running through it. Landline available. Answering machine installed. Master Bedroom has an air conditioning unit in summer. Ceiling fans in other bedrooms. Plus fan in living room, sun room and kitchen. Tower fan in downstairs family room. Electric heat. Thermostats in every room. Set at 55 degrees in all rooms except downstairs Family Room to 68 degrees when leaving. Run dehumidifier in summer; empty before leaving. Outside agency can supply your linens and towels. You need to contact them. I will provide you their telephone number when you book your reservations. Please ask me if your interested. Washer located downstairs family room area. Clothes dryer located downstairs family room area. Renters need to supply their own firewood. Fireplace has two dampers. Firewood must not be kept in house; attracts bugs. We have a steep driveway so 4 wheel vehicles are recommend in winter. Recommend parking at top of driveway; only room for two cars in winter. Do not park across the street . Will be fined or towed. Access located in manual on counter and downstairs family room. The Association has a fitness room located in the Clubhouse. Wireless internet provided. Need to bring your laptop with WIFI card installed in computer. Has sofa and loveseat plus brown leather recliner chair. Flatscreen TV, stereo, DVD and VCR player. Several tapes, games and books provided. Seats 6 but can bring chairs from other room. Renters need to supply their own firewood. Must have dishwasher empty and put away dishes when leaving. Forks in upright position. Hand wash stemware and kitchen cutlery knives. Refrigerator - ice trays provided. Mr coffee maker. Complimentary items #4 filters. Complimentary items for your use. Set for 12 - dishes and silverware. Fully equipped kitchen including hand mixer, bagel toaster, waffle maker, and Oster food processor. Benches in kitchen & around counters. Sun porch has high table that sits 6; however, two other chairs are also provided. (3) 3 flatscreen TVs which have basic + cable....98 channels. 3 flatscreen TVs which have basic cable. DVD player in living room and family room. Some DVDs are provided. Several books are provided as well as magazines. Game room located downstairs; which we call our family room. Has flatscreen TV, coach/sofa bed, extra sitting chairs and table, ping pong table, dart board and air hockey table. Several board games located in living room. Located in back of house. Sitting available by the stream overlooking lake. Balcony deck off of master bedroom with chairs and table. You need to provide your own kayak/canoe which you can launch across top of driveway. No gasoline boats. You need to provide your own boat or kayak which you can launch across the top of driveway. Gasoline boats prohibited. Gas grill on outside deck. Not available in winter. Deck off master bedroom and 1st floor. Patio furniture available on the deck. Not available in winter. Just added a sunporch which overlooks the back yard. Plus a three season room. Minutes away from Camelbeach Ski Resort and the newest resort, Kalahari is minutes away. Minutes away from Camelback Ski Resort, Big Boulder and Jack Frost. Tennis courts located near clubhouse and outdoor pool. Golf course is minutes away. Bunk bed is for children only; less than 100 pounds. Packnplay; stroller available for children. Sauna located in Club House. Pool table located at Club House. Slight charge for use of amenities. Outdoor heated pool available in summer months. Heated indoor pool available at the Club House. (closed for maintenance) Slight charge for use of amenities. Times vary as to when pools are open. Swing/bench near stream overlooking back lake, patio furniture, bar in furnished basement. Three season room available for sitting and looking at back yard. An iron & ironing board is provided. Community has beaches, tennis and basketball courts, indoor and outdoor pool, clubhouse with bar and restaurant. Charge of $15.00 per person for 2-7 days for use of the amenities. Or for one day $5.00 per person. Children under six are free. Trash bag stickers are $5.00 each. Streamline recycling is in effect; do not have to separate; discard items in containers and toss the bags in areas designated. My family and I have been renting this property since before my son was born (he is now 17) and we have never been disappointed. If you want to stay somewhere that reminds you of home with lots of pluses, this is the place for you. This property is beautifully kept, there are always new additions each year we go and we don't want to leave when our time is up! The owners are fabulous and have thought of everything that will make your vacation stay an awesome experience. And no I wasn't paid to write this review - just asked and could fill a book of all the pleasant memories that we have from our vacations here over the years. Don't believe me - check it out for yourself - you won't be sorry!!!!!!!! We are renting his house in the Summer for 6 or 7 years already and plan to rent this Summer again. It became our second home! We usually rent this house for 4-5 weeks to go away from New York City, spend time with our kids and enjoy the nature. The house is big enough for 8 people or two families. Usually, we rent this house with our friends who also have two kids and we always have a great time there! The house is very clean, well maintained, and the kitchen is very good equipped. It has EVERYTHING (it is important if you stay there for a month or so). Our favorite room is a 'sun' room (3 sides window room) where you can observe beautiful yard, lake and watch wild animals and birds, and specially deers. Almost every morning you can see deers on the yard and we always enjoy to watch them (baby deers are sooo cute!). The way the house is located , you can't see your neighbors and you feel like you're really out in the middle of the nature. The house is located on two lakes and it is close to casino, outlet, and Camelbeach waterpark/ski resort (driving distance, but not too far). The owners are always helpful and really easy to work with. They keep the house beautiful and fully stocked. As always, thank you, Jim and Loretta! Thanks so much for your kind words...we look forward to having you again this year. Your house was so relaxing. We loved sitting by the fire while it snowed, watching the deer in the backyard and sitting in the hot tub after a long day of skiing and sledding. We stayed in the house for a week in August. It was a wonderful retreat from the heat of the City. The house is located just across the lake where we spent most of the time. It is spacious, clean and comfortable. I would love to come back next summer. I would recommend this property to the friends and relatives. The listing photos accurately reflected house's appearance and amenities. Thank you, Jim and Loretta! We thoroughly enjoyed our stay and the owners Jim and Loretta were so easy to work with and accommodating to us and our travel schedule! The house is quite large, very clean and well maintained. The yard expansive property is BEAUTIFUL - very picturesque! We had an amazing weekend, filled with sunshine, BBQs, touch football and lots of laughter! And it's only two hours away from NYC! We will definitely be renting again! Thanks Jim and Loretta! Need to visit Adm Office to purchase amenity badges and trash bag stickers. A slight charge for these amenities plus a $25 fee to fill out form. Garbage bag stickers are $5.00 each to use compactor. Compactor open on certain days. Mandatory recycling is enforced. At top of driveway is a lake with a beach, picnic area and playground. Badges are required. Also, need for club house. A slight fee for use of amenities. Fees listed in VRBO description. Also $5.00/bag for Garbage - can obtain at Association Office. In winter, we have a steep driveway. Only 2 cars with four wheel drive. Need 1-2 weeks to process paperwork to sign a short term lease agreement.